Our Executive “Chef Ryan” has the credentials, experience and all of the qualifications one looks for as the leader and creative driver for an upscale restaurant. From Crystal Mountain Resort near Traverse City to shadowing world-renowned Chef Thomas Keller at Per Se in New York City, Executive Chef Ryan Lucas has spent 15 years honing his culinary skills. Chef Lucas was the Valedictorian in his graduating class at The Culinary Institute of America located in Hyde Park New York. He completed a Culinary Arts Management degree. To round out his ability to create the complete meal pairing food and wine, he obtained a Level 1 Sommelier certification. 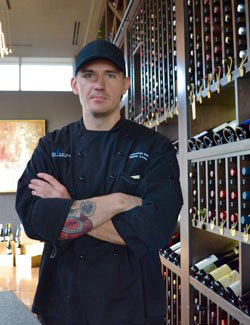 In addition to his culinary background, Chef Lucas served 4 years in the United States Marine Corps as a field radio operator deployed to 15 different countries during his time in service. “Ryan’s life experiences, culinary education, background, and training make him the ideal Executive Chef” states Joe Goodsir, proprietor of Capital Prime. ”Ryan has applied his skills and expertise to Capital Prime as the Executive Chef and continues to amaze us with his creative application! His excitement to create fresh, new, innovative dishes keeps Capital Prime on the cutting edge,” stated Joe. We are fortunate to have a leader like Chef Ryan. Executive Chef Ryan Lucas continues to raise the bar with every new menu introduction, and elevates us to new levels of food and service in our community. Bon Appétit!